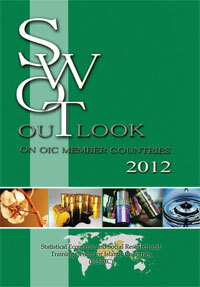 The SWOT Outlook 2012 is the second issue of the SESRIC recent series on the subject whose first issue was published in 2011. Following the analytical approach of SWOT (Strengths, Weaknesses, Opportunities, Threats) method, the profile of OIC Member Countries, as a group, in different fields and sectors are presented in a comparative manner with the groups of developed and other developing countries as well as the world average. The analysis includes most relevant statistical data and background information that would make the OIC Member Countries better informed of their significant potentials, dire needs and future challenges in order to prioritize effective cooperation areas and facilitate sound integration schemes. In this regard, it also serves as a critical roadmap for better strategic planning and policy making at the OIC level for achieving higher levels of welfare and socio-economic development. Through highlighting the strengths and opportunities of the OIC Member Countries, it aims to contribute to the efforts of the OIC Member Countries toward pursuing the most efficient fit between their strengths and opportunities that can be utilized for further growth and development. To reduce the vulnerability of OIC Member Countries, it also indicates major weaknesses that need to be overcome as well as potential threats that may be faced in the future.